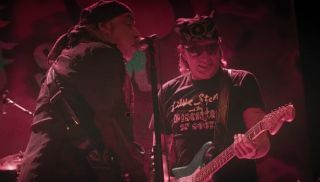 The performance comes off Little Steven's 'Soulfire Live!' Blu-ray release. Richie Sambora Posts Fan-Created Music Video for "Come Back As Me"
As we've reported, Richie Sambora released a defiant new song called "Come Back As Me" in July. When it was released at the time, the song didn't have a video to accompany it. Listen: Richie Sambora Premieres Defiant New Song, "Come Back As Me"